We are delighted to share some very exciting news and invite you to a special mural and storytelling reception at the Arizona Capitol. We hope you can come! We want to fill our state’s most historic building rotunda to its 100 capacity! The Phoenix Phabulous Murals will be featured at the Arizona Capitol Museum at our state capitol building from Feb. 2 through April 4. You are invited to visit during museum hours. Come and join a hosted, fun time to celebrate our city’s history as well as mingle and learn from those who have served in high-profile media roles. The Arizona Capitol Museum is located at 1700 W. Washington Street in Phoenix. Free parking is available just to the east of the capitol in the public parking lot. 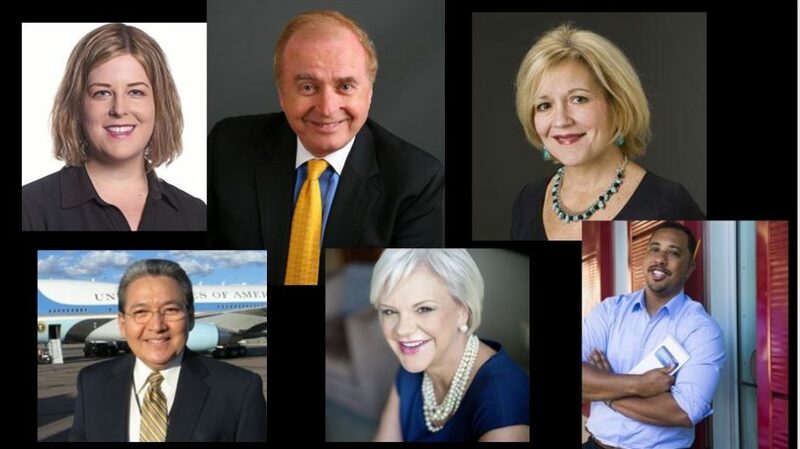 Arizona Secretary of State Michele Reagan will open the program and six local Phoenix media icons will share their short stories connecting to a Phoenix time period and something fascinating from their work as local reporters. Storytellers include Phoenix media reporters and community icons Pat McMahon, Frank Camacho, Jacquee Petchel, Greg Moore, Brenna Goth, and Deborah Bateman. Sharing their personal short stories, they will talk about pivotal moments in work as well as their relationship with Phoenix from the past, present and future. Pat McMahon, local media icon, TV and radio personality. McMahon will bring the 1960s to life, weaving together his nearly 60 years of Phoenix television and radio news and talk shows on stations including , as well as from his performances on The Wallace & Ladmo Show. The show aired on KPHO-TV/ Channel 5 from 1954 to 1989, and McMahon joined the cast in 1960. McMahon is a longstanding fixture on the Phoenix broadcasting scene where he has worked at AZTV, as well as KTAR, KRIZ, and KOY radio stations—serving as program director, disc jockey, and talk-show host, among other positions. Jacquee Petchel, Executive Editor, Carnegie-Knight News21, Professor of Practice at Arizona State University. A Phoenix native, Petchel is the executive editor of the Carnegie-Knight News21 multimedia investigative reporting initiative. She is an award-winning investigative reporter, editor and producer who most recently served as senior editor for investigations and enterprise at the Houston Chronicle. Prior to that, while serving as an investigative reporter at The Miami Herald, Petchel was part of a team that won the 1993 Pulitzer Prize Gold Medal for Public Service for an investigation into property damage in South Florida caused by Hurricane Andrew. She served as a reporter at The Arizona Republic during her early career. Frank Camacho, a Phoenix native and consultant who spent 28 years as a news anchor and reporter at KTVK-TV. In the beginning of his broadcasting career, Camacho reporter news for radio stations KRUX, KQXE, and KTAR. His first television news position was at the Phoenix independent KPHO-TV. Greg Moore, a sports columnist at The Arizona Republic, first came to Phoenix as an Associated Press reporter in 2011. In 2015, he moved to Milwaukee to become AP’s Wisconsin correspondent, returning to Phoenix in 2017 as sports columnist at The Arizona Republic. He’s served as an adjunct faculty member at Arizona State University’s Walter Cronkite School of Journalism and Mass Communication. He’ll share his unique connection to Phoenix, where he’s raising his family and connects sports to greater civic engagement. Brenna Goth, Southwest staff correspondent for Bloomberg BNA based in Phoenix, covering regional business, government and economic development news, is a former reporter at The Arizona Republic as well as a native Phoenician with an affinity for Downtown Phoenix urban vibrancy. Journalism has taken Brenna throughout Latin America. She’s reported from the Arizona-Mexico border, an indigenous radio station in Guatemala and the rainforests of Costa Rica. Her personal connection to Phoenix will reflect these regional, national and international perspectives. Deborah Bateman, an Arizona native who grew up in Mesa, is President of Deborah Bateman LLC, a professional leadership coaching and consulting organization, where she features a digital blog focused on personal discovery and growth titled “Rick Blossoming.” After a long career in the banking industry, Deborah serves as the Vice Chairman of the Board of Directors for National Bank of Arizona. Her diverse career has spanned more than 40 years of personal reinvention and connection to Phoenix, including both entrepreneurial, corporate and community service leadership roles. We hope to see you at the Phoenix Phabulous opening reception at Arizona Capitol Museum on Thursday, Feb. 8!